Craft a holiday scene: unfold the Hatchimals collectible Advent calendar to discover a winter scene right out of hatchtopia! with over 50 surprises to discover, you can build out your holiday scene each day! it's the classic holiday tradition with a Hatchimals twist! 50+ surprises to discover: open up a tiny door each day to discover paper craft decorations, small presents, stickers and accessories for your Hatchimals! add them to your winter scene and create a magical Wonderland! Exclusive characters and nests: this Advent calendar has exclusive characters both in-egg and out-of-egg! your new festive Cuties even come with attachable accessories! keep them cozy in the sparkly nests, exclusive to this calendar! 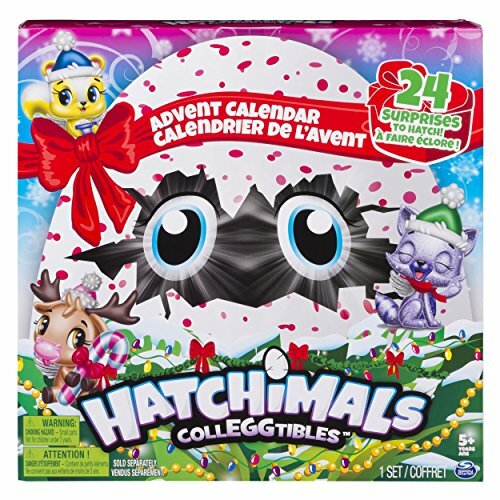 The Hatchimals collectible Advent calendar is a great gift for kids aged 5+. have the hatchiest holiday yet!